Efficient selection of sensory signals representing the target of focal attention can account for improved behavioral performance. A) When subject is trying to focus attention on one target (yellow highlighted stimulus in right panel) and ignore distractors (blue highlighted stimuli), neural responses were increased in occipital visual areas of the brain. 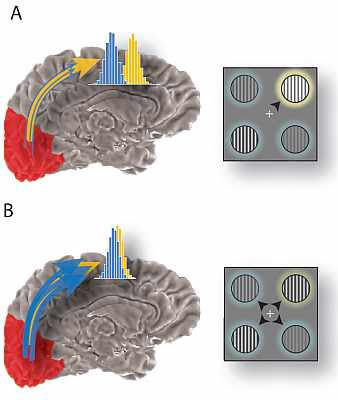 B) When subjects distributed attention across four stimuli, signals from distracters (blue arrows) had the same magnitude as signals from the target (yellow arrow), causing both relevant and irrelevant information to be routed to perceptual areas of the brain and resulting in less discriminable neural response (more overlap between blue and yellow distributions). Scientists at the RIKEN Brain Science Institute (BSI) in Japan, have uncovered mechanisms that help our brain to focus by efficiently routing only relevant information to perceptual brain regions. The study will appear in the science magazine Neuron. The results provide valuable insights on how our brains achieve such focus and on how this focus can be disrupted, suggesting new ways of presenting information that augment the brain's natural focal capabilities. How can the brain be able to focus attention given the many distractions around? The study points out that the answer may lie in two distinct processes; the "sensitivity enhancement" and the "efficient selection". Sensitivity enhancement corresponds to improvements in how neurons in the cortex represent sensory information like sounds and lights, similar to the volume control or reception control on a television set. Efficient selection is more like a filter, routing important sensory information to higher-order perceptual areas of the brain while suppressing disruptions from irrelevant information. Video: Nicholas Carr - Memory can only hold between two and four items at a time.